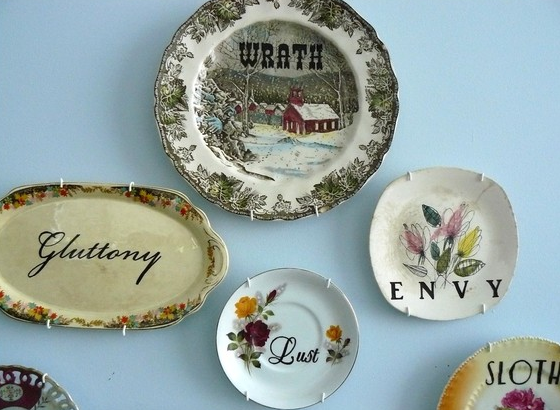 These deliciously witty plates are made from actual vintage pieces of china! Etsy seller trixiedelicious takes traditional pieces and puts unexpected words or images on them, then resells them to you to hang or use in your own ironic setting. Some of the pieces have hairline cracks or small chips, but that’s just the charm of buying vintage. 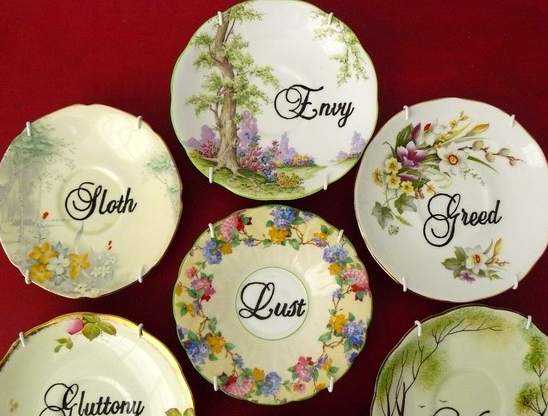 Her “Seven Deadly Sins Plates” sell for about $150 (as a set), but she has lots of single pieces that are less expensive. I can’t stop chuckling at the red cabin plate that says “wrath.” What a wonderful way to capture dysfunction on a piece of dinnerware! No wonder Lady Gaga is a fan! You can visit her store and get some up-cycled, “vandalized vintage” goods here. ← Inspirational Palette: Getting Ready For Spring!